The path up to the giant Saguaro was only one of the inclines on our 2.3 mile hike yesterday. Me, Ed, and my friend Kim met at 6:15 a.m. to do this hike in Catalina State Park. The early hour was my idea because once the sun comes up, it's too hot for me. At 6 a.m. it was already in the seventies. 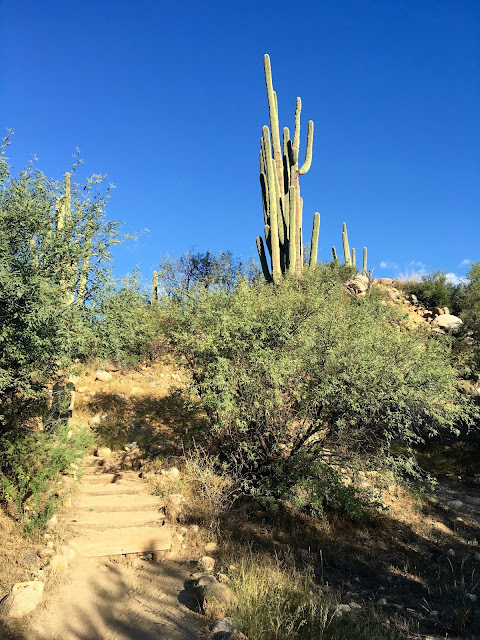 I was happy to see the largest cactus in the United States because it marks the beginning of the trail's descent - the steps up finally head downward just after the top of the hill. You can see Ed and I glistening from our uphill effort HERE. The hills are easy for Ed and Kim, but for me, it's like climbing Mt. Everest. By the end of this hike I was a dripping mess. But I did it!